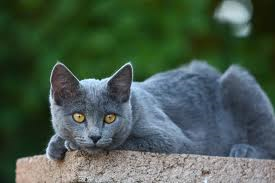 Smokey was born into a colony of wild cats living in a barn. Typically, these cats are unapproachable and will have nothing to do with people, but Smokey was good natured and affectionate from first contact. He was purring and kneading as if he had been accustomed to civilization. His new owners decided to make a commitment to do whatever it took to get him healthy and provide a good home. Because none of these cats were vaccinated, Smokey had a severe upper respiratory infection with ulcers on his tongue. Blood tests had been done to determine his viral and health status. Since May, he has required extensive therapy with antibiotics. Smokey lost half of his tail due to an untreated injury sustained in the wild. Smokey then had his matted hair shaved off, which made life much more comfortable for him. After preoperative testing was complete, he was finally able to be neutered. Smokey’s owners say he just laps up all the attention he can get. Nothing fazes him. Smokey is now officially a “Stay at home” pet and wouldn’t have it any other way. In other words, a complete makeover.